The struggling Saints face off against visitors who will be intent on returning to winning ways. Southampton host Watford on Saturday as they look to improve a poor record so far this season, which most recently saw the Saints take a hammering from champions Manchester City. The Citizens romped to a 6-1 victory at the Etihad, extending their visitors’ winless run to seven games. That last win came at Crystal Palace in September, and Southampton are yet to yield three points from a tie at St Mary’s. The problem for Mark Hughes’ side is clear. The Saints are capable of being solid in defence and create an abundance of chances going forward — in fact, they have the fourth most shots per game in the league to date. However, not enough of these shots are put away, which results in a fairly dismal goal tally: seven strikes leave Southampton second-bottom of the scoring charts. Watford endured similar hindrances to their performance in the 1-0 loss to Newcastle United last weekend. The Hornets fashioned an abundance of goalscoring opportunities but were unable to find the target on each occasion, finally punished by an Ayoze Pérez header on 65 minutes. A negative result always seems to overshadow a performance, no matter how encouraging or negative it was, and this was certainly the case for Watford last weekend. Javi Gracia’s side defended well for the majority and, on another day, would bury several of the plentiful chances they created. With a tough run of fixtures approaching — including home encounters with early title contenders City and Liverpool as well as trips to Everton and Leicester City — the Hornets will be treating their trip to the south coast as a must-win fixture in the hope of avoiding the traditional festive collapse which has become such a feature of each season since promotion in 2015. The two sides actually met three times last season, a fairly rare occurrence between two Premier League sides. 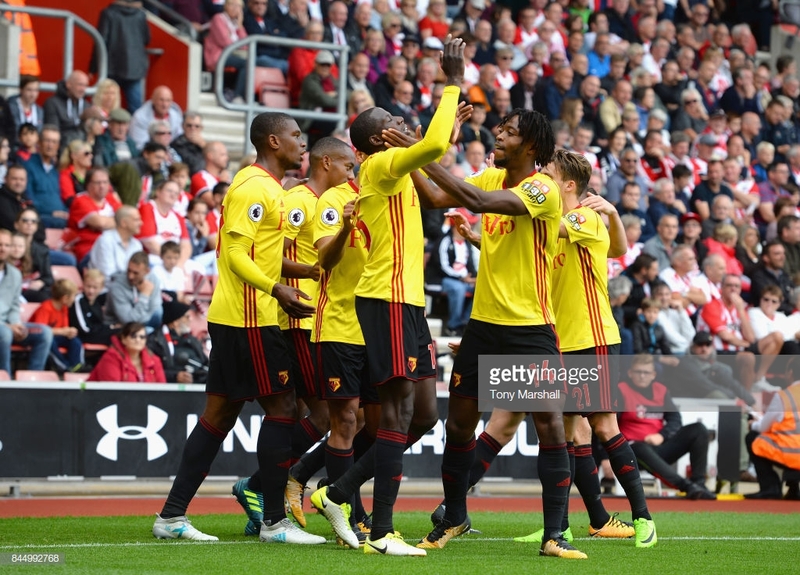 Two of those came at St Mary’s; goals from Abdoulaye Doucouré and Daryl Janmaat secured a win for Watford in September, before a Jack Stephens strike dumped the Hornets out of the FA Cup in Gracia’s first match in charge in January. However, the most notorious meeting came at Vicarage Road, just two weeks before the FA Cup tie. Southampton took an early lead through a James Ward-Prowse double, but a Watford fight-back in the second half was rounded off with a last-minute strike from Doucouré. On the face of it an impressive comeback from the hosts, yet replays showed that the Frenchman’s injury-time diving header had in fact been guided into the net by his hand. Dutch defender Wesley Hoedt will likely be uninvolved after a foot infection prevented the centre-back from training in recent days. Otherwise, Hughes has a full squad of players to choose from, though there are slight doubts over the fitness of former Juventus midfielder Mario Lemina who is suffering from a tight thigh. Meanwhile, Gracia, who reportedly signed a new three-year contract at Watford during the week, has confirmed that captain Troy Deeney will return to the fold having missed the last three games with a hamstring problem. Long-term absentee Tom Cleverley is back training with the squad but will not considered for selection, meaning the place of the suspended Etienne Capoue is expected to be filled by Nathaniel Chalobah. Janmaat and Sebastian Prödl remain sidelined for the foreseeable future. Southampton - McCarthy; Cédric, Stephens, Yoshida, Bertrand; Ward-Prowse, Lemina, Højbjerg; Long, Ings, Redmond. Watford - Foster; Femenía, Mariappa, Kabasele, Masina; Doucouré, Chalobah; Hughes, Pereyra; Deulofeu, Success.